The 1976 film is brought to the New York stage by director Ivo van Hove, who won a Tony Award for "A View From the Bridge." If you go: “Network” runs through March 17 at the Belasco Theatre. 111 W. 44th St., networkbroadway.com. In 1976, Sidney Lumet's “Network” was written off by many as an outlandish, unbelievable satire — including Walter Cronkite, whose daughter had a small role in it. The Oscar-winning film followed veteran television newsman Howard Beale, who, on the verge of being fired for low ratings, goes manic and urges his viewers to get “mad as hell,” making him more popular than ever. In 2018, “Network” — which can now be viewed on Broadway in a freewheeling, fast and furious, absolutely mesmerizing stage adaptation starring Bryan Cranston as Beale — feels all too familiar for comfort, having presaged the commoditization and corporate takeover of the news, mistrust and misuse of the media, televangelism, going viral, reality TV and exploitation of the general public’s frustration with the state of the world. 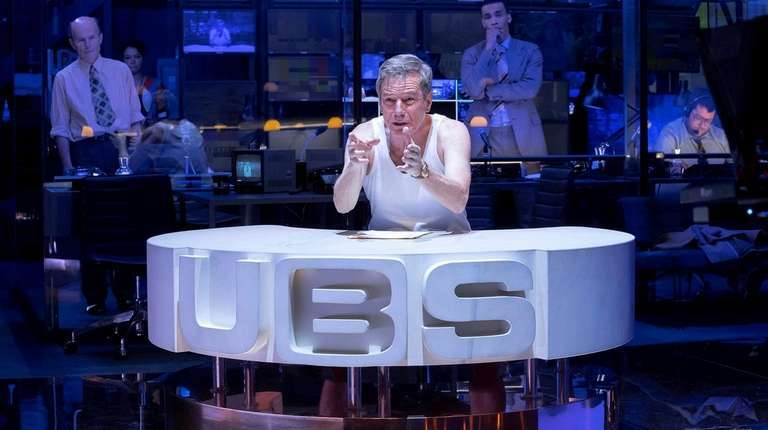 The Broadway production (which originated at London’s Royal National Theatre) is built upon a sleek, seamless, multimedia-enhanced, constantly busy and buzzing staging by international director Ivo van Hove, with scenic and lighting design by Jan Versweyveld (van Hove’s professional and life partner). It is not so different from van Hove’s prior productions — including “A View from the Bridge” and “The Crucible” on Broadway and more recently “The Damned” at the Park Avenue Armory. But whereas his tech-savvy, experimental approach often comes off as overblown, self-indulgent, pretentious and bewildering, it is perfectly suited to the media-overflow milieu of “Network.” A more traditional staging could not have been as gripping. Although playwright Lee Hall (“Billy Elliot”) incorporates the bulk of Paddy Chayefsky’s original screenplay, the overall tone of “Network” has shifted from comedy into fast-paced thriller and ominous tragedy, with the larger-than-life Beale not unlike a Greek or Shakespearean tragic hero who undergoes a wild journey and suffers a gruesome fate. A coda has also been added in which Beale warns of the “destructive power of absolute beliefs.” Eerie music consistently plays in the background. Cranston, who won a Tony in 2014 for his performance as President Lyndon B. Johnson in “All the Way,” gives an all-out, remarkable performance — full of raw emotion, magnetic presence, superb comedic timing, and a genuine sense of struggle, unpredictability and urgency. The strong supporting cast includes Tony Goldwyn as resigned television producer Max Schumacher, Tatiana Maslany as shameless and relentless programming executive Diana Christensen and Joshua Boone as hungry corporate superstar Frank Hackett. It runs two hours without intermission — and flashes by as quickly as one of the commercials running on one of the countless screens in the background.